Muddy paws in your house or your car can now be a thing of the past. For years, I have used a towel trying to get my dogs’ paws clean and dry, and it never seems to do a great job. A dog paw cleaner or a dog paw washer is the easy way to get those muddy paws clean and it is much easier than using a towel. A dog paw cleaner is a bit different from a dog paw washer. A dog paw cleaner is a type of cloth specially designed for cleaning your dog’s paws. A dog paw washer is a small device designed to make it easy to clean your dog’s paws by you sticking your dog’s paws into some type of reservoir with water that will have soft bristles to help remove dirt from your dog’s paws. You can add a gentle soap or just use clean water. You will either spin the container or move your dog’s paws over the bristles. Using a Dog Paw Washer might take some getting used to for your dog, but it shouldn’t be overly difficult if your dog doesn’t mind you handling their paws. This would be considered a dog paw cleaner, and one that I highly recommend. Not only will it work great for cleaning your dog’s paws, it also works great for drying or cleaning your dog’s entire body. The Spotless Cleaning Glove is made with microfiber that attracts dirt like a magnet. It holds 600% of its weight in dirt, grime and water. It is soft, super absorbent that has a unique six fingered glove, designed for use with either the right or left hand and either side can be used. The microfiber’s special absorbent qualities allow the glove to be used over and over before requiring washing. Fingers work for getting in between toes. The microfiber helps dirt get broken down and captured in the microfibers. Cotton fibers that are in most cloths will smear mud. They also stay wet and breeds mold and mildew. They are bulky and difficult to handle and need to be washed after one use. and split of the fibers are woven and split in such a way that creates microscopic hooks that attract and hold dirt, water and mud like a magnet. Microfiber is environmentally safe and hypoallergenic. It comes with a convenient door loop with a buckle that you can hang from a doorknob or handle or attach it to your belt loop. Machine washable and dryer safe. Do not use bleach or fabric softener. Fabric softener clogs the fibers, making the glove less effective. I would recommend getting 2 gloves. If you need to wipe down your dog’s body, you can do it in half the time with both hands working. If you don’t use 2 at once, you will always have one clean and ready to use. My rating is 4.5 stars out of 5 stars. In customer reviews, 69% of the people who have purchased this product have rated at 5 stars and most like the convenience of not having a towel lying around and dogs that are sensitive to having their paws touched generally haven’t had any problems using on their dog’s paws. Pros: Not only will it work great on your dog’s paws, it also can be used to wipe down your dog’s entire body. Convenient to use and easy storage with attached handle for hanging on door knobs. Cons: Some customers felt it was a bit overpriced. Petkin Paw Wipes are veterinarian approved wipes that provide an easy way to clean your dog’s paws. Stops the spread of dirt and odor in your home or car. They contain extra cleansers that removes even the toughest dirt and odors. Conditions to soothe rough, dry or cracked paws. Extra strong and absorbent and gentle enough to use every day. Made with aloe, vitamin E and deodorizing fragrance. One wipe usually will be enough for all 4 paws. Uses natural, recycled, biodegradable or recyclable materials for a healthier planet. There are two requirements that Petkin’s has as a company. The quality of the product has to be the best it can possibly be and the product has to be easy to use. Petkin’s has a 100% guarantee on all orders within 30 days of receipt of the product. If you are unhappy for any reason, ship back the unused portion with your receipt for full refund of purchase price. There is also an antibacterial wipe available and a to-go pack. Safe for dogs that lick or chew their paws. My rating is 4.5 stars out of 5. 75% of customers who use this product rate it at 5 stars and will plan on continuing to use the product. Only 1 customer rated it at 1 star. Pros: Very easy to use and convenience of use. Most dog owners find the scent pleasant and use the wipes on their dogs entire body in between bath to help keep them smelling fresh. Cons: A bit expensive since you can only use a wipe once. This dog paw washer has a unique built in clean and dirty water reservoirs. This allows you to fill it with clean soapy water and simply tilt the Paw Boss in different directions to fill and empty the paw washing cup. Submerge the dirty paws and move back and forth over the soft finger like cleaning pad to remove the dirt. The Paw Boss eliminates 99.5% of the bacteria and 99.9% of the fungi when used with antimicrobial soap based off independent laboratory results from a dog’s paw. It is designed to soap and soak every paw with fresh clean soapy water. No more going back and forth to the sink to get clean water. Holds 72 ounces of water with a 3.5″ diameter wash cup that is 2 1/4″ deep cup with a removable cleaning pad. Washes 8 paws with one filling. Weighs 7 pounds when filled. No moving parts to wear out. Made in the United States. Available with customizable designs to fit any decor you want to match. To clean, rinse both reservoirs every time you empty and refill to prevent buildup. Included directions on how to vigorously clean the inside of the reservoirs. It does not come apart in order to prevent leaking. Limited warranty to original purchaser that is based on being free from defects in material and workmanship. It has a 30-day warranty beginning from date of purchase. Proof of purchase required. Due to health regulations, all used merchandise can not be returned or exchanged except for manufacturing defect within 30 days of purchasing Paw Boss Wash for dogs. My rating is 4 stars out of 5 stars for this product. Of consumers who have purchased this product, 67% of them rated the product at 5 stars. The lower ratings were from customers who either couldn’t figure out how to switch from dirty water to clean water or from customers whose dog’s didn’t like the system. Pros: Great product for leaving at the door ready when your dog’s paws need some work. The only system where you can wash up to 8 paws, each in clean water without getting fresh water repeatedly. No moving parts, so nothing to wear out. Easy to use with a low profile, making it easy to get your dog’s paws in the cleaner. Cons: Hard to clean the reservoir since it doesn’t come apart. Paws will come out wet and you will still need to dry them off. This paw wash can work great as a portable paw wash. It is similar to a cup that you can stick your dog’s paw into. It has soft, gentle, silicone bristles that loosens dirt and mud from your dog’s paw. Simply add some water to the cup, insert your dog’s paws into the cup and gently twist the cup while your dog’s paw is in the cup to remove the dirt. Available in 3 sizes to get the right fit for your dog. Large size – for large and extra large sized dogs. It measures 8.85″ tall and 4.75″ wide. The open top allows a paw up to 3.5″ wide. Works great for Bulldog, German Shepherd, Golden Retriever, Labrador and Husky. Medium size – measures 6″ tall and 4″ wide. The open top allows a paw up to 2.5″ wide. Works for Australian Shepherd, Beagle, Border Collie, Boxer, Corgi, English Bulldog and most Terriers. Small/Petite size – measures 4.3″ tall and 3.65″ wide. The open top allows a paw up to 2″ wide. Breeds that generally fit this size are Chihuahua, Dachshund, Maltese, Pomeranian, Yorkie and Boston Terriers. My rating is a 4 out of 5 stars. 69% of consumers who have used this product have rated it 5 stars and have been very happy with the results. Most complaints were with the sizing not working well for their dog. Pros: Portable and easy to use. Easy to clean container. 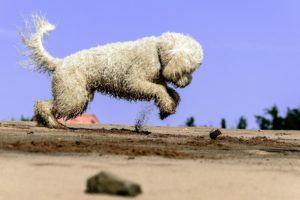 Does a great job cleaning mud and sand from your dog’s paws. Three sizes available. Cons: Might have to return to the sink for fresh clean water before you get all the paws clean. Paws come out wet and you will need to still dry the paws off. You need to keep your life easier by either purchasing one of the 2 dog paw cleaners or one of the 2 dog paw washers that I have reviewed here. All of them are great choices with options that will work best for your dog and situation. Choose one that is easy to use for you and make sure it is something that is comfortable for your dog. If you are getting a dog paw washer, make sure it has soft bristles or brushes that won’t hurt your dog’s feet. The bristles should be made of silicone, rubber or soft plastic. 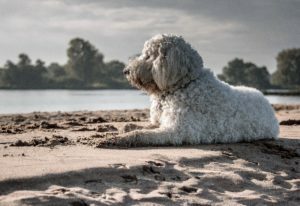 Washing your dog’s paws will not only keep your house cleaner, but it is also great for dogs that have environmental allergies, by removing the allergens from your dog’s paws. 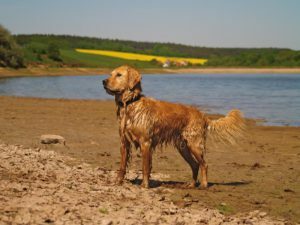 If you have a dog that really likes getting into mud and getting dirty, you might want to invest in dog booties to help keep their paws clean, or a portable dog bath to help with your dog cleaning. If you have any questions or comments, please leave them below. 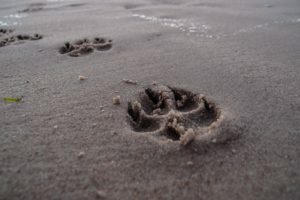 You can follow justforyourdog.com on Pinterest, Twitter or FaceBook. Hello Marla. Season’s greetings to you. I hope you are having a good time? Thank you for sharing your review of the best dog paw cleaner which will enable me to easily clean my dog’s paws. Those muddy paws need to be cleaned before doggie comes in and I think these one of these recommended paw cleaner will do the job perfectly. Which one should I go for? Barry, thanks for reading and for commenting. I think the best one depends on your dog and your situation. Personally I really like the Spotless Paw Glove. That is because many times my dog doesn’t have just dirty paws, but he usually finds some water to get into also, and with the Spotless Paw Glove I have the ability to wipe down his entire body. I do also like the Dexas Petware Mudbuster is it is just a small mess. It works quickly and a quick tip of each paw can get my dog back in the house without making a mess. Those would be my 2 favorites, but I do feel they are all good choices. Oh wow…I did not know that all these things existed…amazing. I am new to pet ownership, but I TOTALLY get it about dirty paws. When that happens in our neck of the woods, I simply take the doggie to a bath…yes, it just is easier to clean him that way. Now, thanks to you, Marla, I have a few options that I will be checking out. I love the first one…Spotless Paw Dog Paw Cleaning Glove – Dog Paw Cleaner…I think I will like this one. Appreciate it, and I will be ‘looking around’ your website for more tips. Thanks Michelle. I am also in favor of the Spotless Paw Dog Paw. It has so many uses besides just your dog’s dirty paws. It is a great tool to use if they have been out in the rain or a recent swimming adventure to help dry them off and clean them up. I am glad you found the information helpful and I hope you will be back again to learn more information for your new family member. These are way cool, finally an easy way to clean to those darn dirty paws. Your right towels just don’t seem to do the trick and when your done you have this messy towel to deal with. This is going to be great to use on my pets paws after we have taken a trek through the woods before I let them in the car. I can finally keep the car somewhat clean now. At first when I came across the (six finger glove) I thought you might have made a typo, lol but after watching the video I’m assuming the extra finger is so you can use either hand., quite clever. Kim, thanks for reading my article and I am glad you found the information useful. The 6 finger glove will work great for you when you are out hiking. It is easy to carry along and will work great before you put your dog back in the car. You are correct about it having 6 fingers so you can easily use it on either hand and also flip the glove around to use either side.